Guy terrified of heights has terrible friends who make him 'bungee jump' for his own bachelor party. Bachelor parties often evoke visions of strippers, drinking, and one last wild night with your best guy friends before taking the plunge into married life. 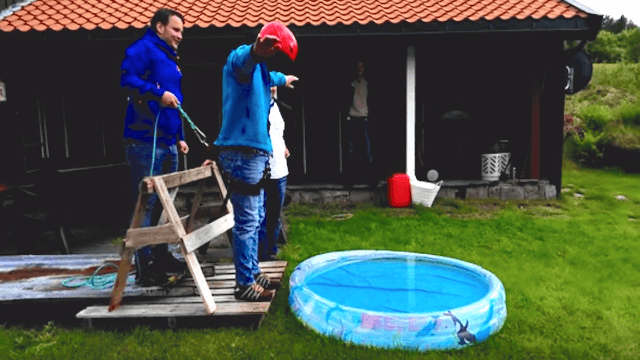 For one Norwegian bachelor, his party was replaced with a two hour prank at his expense that ended with a plunge into a shallow kiddie pool. Ah, that's what friends are for. This Norwegian grooms biggest fear is height and he especially bungee jump and parachuting was the two main things he did not want to do on his bachelor party.. After two hours with a blindfold he was ready..
Two hours of being blindfolded thinking you were going to face your biggest fear, and you actually just land face down in a foot and a half of water. You would think that the groom-to-be would be pissed that his friends carried out a long and stressful prank in place of throwing him a proper party, but it looks like he was so happy to be on solid ground that he didn't care.